Many Russians may still break out a bottle of Soviet champagne on Dec. 31, but the growing trend toward high-end wines indicates that a change in the market is at hand. More than 40 percent of all alcohol in Russia is sold in the two weeks before New Year’s Eve, and while vodka sales continue to take the lion’s share of this percentage, an ever-increasing segment is made up of high-end wine. Russians’ drinking habits have changed noticeably over the past decade. In the 1990s, expensive wines and Champagnes were exclusively the domain of the new rich, who appreciated them more as a status symbol than a quality product. Today, oligarchs may still serve Petrus as their table wine, but the main shift from beer and vodka to wine is taking place in the growing class of young professionals. Holiday shopping: What to choose? This cohort, mostly made up of top and middle managers at both Russian and multinational companies, have traveled and studied abroad, and have brought back from their experiences the idea that wine culture is something worth exploring. Wine education has become a popular way to socialize out of the office, too. In addition to wine tastings offered by wine importers, restaurants and cooking schools have begun including wine and food pairing courses in their curriculums. In the past several years, cooking classes have become very trendy in Moscow, and with the expansion of interest in wine and spirits, instruction in what to drink with what you cook was a natural addition to the market. And for those who prefer to go out, Moscow’s restaurant and bar offerings continue to expand. A major trend in the Moscow restaurant scene in 2012 was the increase in the number of wine bars — small, intimate spaces that offer a wide selection of wines by the glass. Wine pricing is usually the Achilles’ heel of any Russian restaurant; the exhorbitant mark-up means that only people able to splurge can order a bottle on the premises. One Western trend that could allow customers to enjoy an affordable bottle of wine with their meals — the corkage fee — has yet to make it to Russia. Of course, that just means that many Russians prefer to drink at home — particularly on New Year’s Eve, which many people spend with family and friends, talking over drinks in the kitchen. 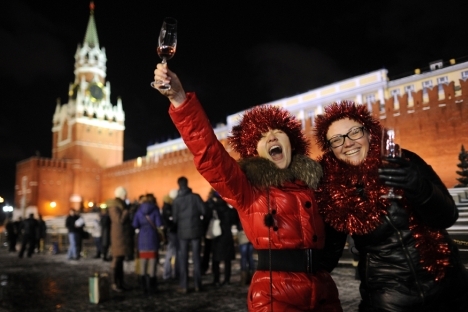 On New Year’s, in Russia as elsewhere, most people prefer to celebrate with a sparkling wine, but those who toast the New Year in Moscow with a glass of true Champagne remain in the minority. The most popular drink for the evening is the cheap, sweet Russian sparkling wine known as Soviet champagne; Italian Asti is also popular. The number celebrating with a bottle of Cristal remains small, although this is still a good thing for the market overall: In the near future, Russia is bound to become one of the world’s fastest-growing markets in the Champagne category.